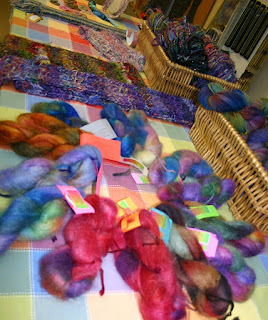 Ellyn Cooper Trunk Show yarn and patterns have returned!!!!! Here now at the shop! 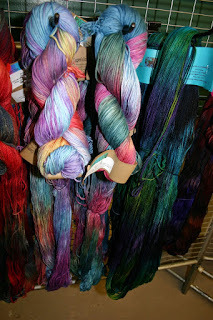 A trunk show from Ellyn Cooper Yarn Sonnets.... these amazing hand-dyed yarns are visiting now for a limited time! Come and feel the beautiful colors and fiber blends. Everything from lace to funky hand-dyed-and-tyed bulky yarn and lots of wools, rayons, bamboo, silks and cashmere blends make this an amazing trunk show. 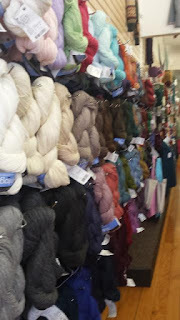 Great yarns in colors you will love! 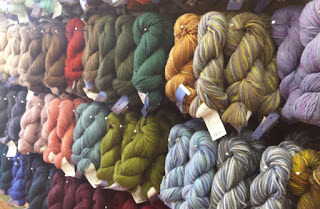 And, newly restocked is the entire line of Berroco Vintage and Vintage Colors in Worsted weight! Back in time for your wash and wear Fall projects. Vintage is a beautiful yarn that is perfect for young and old - this easy care worsted weight yarn is available in 100 gram skeins and comes in lots of colors. See you soon and Happy Fibering!